* Limited-Time Special Just $2.99! In celebration of our 8-millionth download -- this is our best version, EVER! 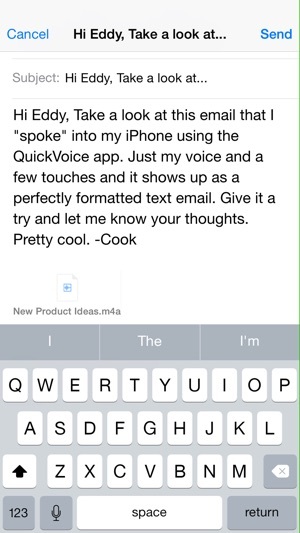 QuickVoice PRO is the iPhone/iPod/iPad's premier recorder, with SpinVox for sending TEXT EMAILS using just voice and a few touches...No Typing Required! Also includes a bonus copy of our $15 award winning computer software, QuickVoice for Mac or Windows, and unheard of MONEY BACK GUARANTEE! "What's On iPhone" calls QuickVoice "The Most Exciting iPhone App Update EVER!!" Google the review--it's worth the read. News! QuickVoice now features a built-in ringtone recording feature so you can produce your own high quality ringtones for free. Use recordings of your music, friends and family, or sound effects then assign different tones to different contacts... Very cool! 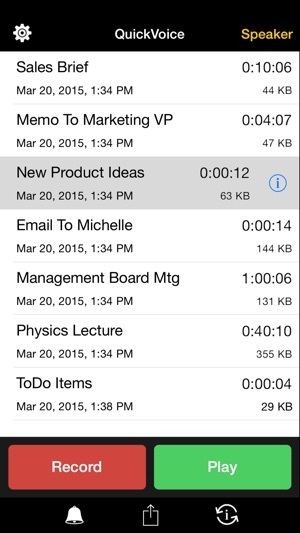 Both QuickVoice for the iPhone and the computer "companion" app are ideal for capturing ideas, voice memos, dictation, "to do" lists, classes, meetings, even entire lectures and seminars! Ideal for professional, educational, and personal use. No other speech app even comes close to all these features and value! * Simple ‘Touch & Speak’ Design! * SpinVox Voice2Text Emails to 30-seconds! * Super useful Voice Reminders! * Send voice notes via Messages! * Send Voicemails Up To 20MB! 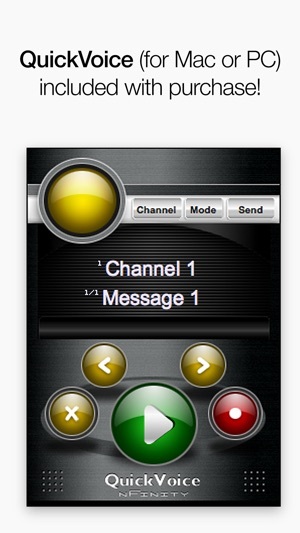 * Built-In Ringtone Recording Function! * Pause Record...a must have! * Adjustable Recording Qualities to 44.1kHz! * Records For Seconds or Hours! 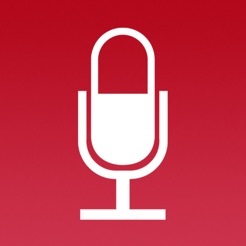 * BONUS Desktop Recorder For Mac or Windows! * Use Other Apps While Recording! * and MONEY BACK GUARANTEE! Visit nFinity's website or YouTube channel to view demo video of "QuickVoice2Text Email." 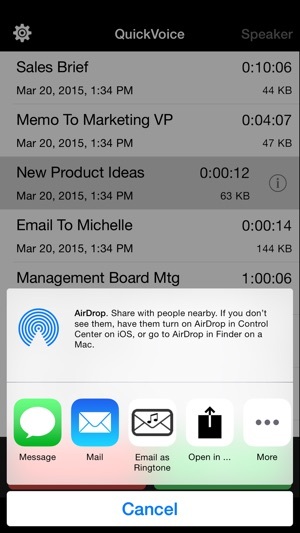 • Corrected an issue with the sharing feature so now users can share recordings with services like Dropbox as well as with other apps, that support the playback of QuickVoice recordings. I bought this app some time ago to record meetings but over times I am seeing an error message to the effect that recording has stopped. This error has become more frequent over time. I can generally start recording again if my iPad is in locked status there is nothing to indicate recording has stopped. I have tried to contact the vendor but as the contact form is broken (it branches to a domain that is for sale when you click submit) and the emails sent to addresses I have for them do not work. I am using an iPad mini 2 (model ME279LLA) running the current version of iOS (9.3.5) and there is about 3GB of free space on the iPad. I am really hoping someone from the company will see this review and at least fix the contact form but until they do, I cannot in good concience recommend this app to anyone as there is not an indication that it has failed if the device is in lock state and critical data may have been lost before people realize it is not recording. I feel somewhat guilty about posting this review as I got several years of use from the app before this started happening. I’ve tried a bunch of recording apps and this is my favorite. I started out with the free app and liked it, so I sprung for the paid app — to get the file sharing options and voice-to-text emailing — and am glad I did. Pls don’t change a thing. Keep it simple. Thanks! 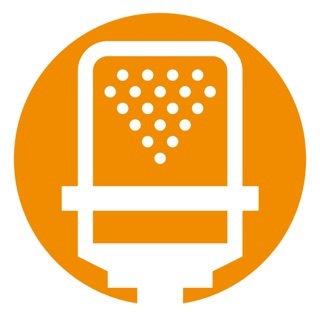 Note: Noticed some reviewers having trouble getting recordings off their devices… Use the File Sharing function. It couldn’t be easier. Look it up on Apple’s site (or the “i” button, for Info, on the app). Hope this helps! Company completely unresponsive? Are they still in business? I bought this app because the free version of QuickVoice stopped exporting audio files from my iPad to my Mac through iTunes. I wanted to be able to upgrade and then transfer my files to my Mac. This app does not solve that problem. Furthermore, when I attempted to try to reach the developer through the developer website and through the various links listed in the App Store and within the app itself, I have received absolutely ZERO RESPONSE. Several weeks have gone by, and no one has responded to me. I would think that the company is no longer in business –– except for the fact that they did take my money for this app. You have been warned. Caveat emptor.